This foldable helps students remember tricks for factoring trinomials with positive and negative numbers. Printing Tip: Print double-sided, flip along the shorter side. This foldable helps students remember tricks for factoring trinomials with positive and negative numbers. Printing Tip: Print double-sided, flip along the shorter side. 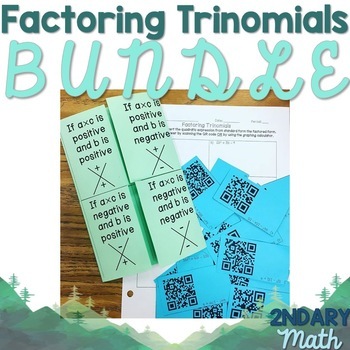 Product #2: Factoring Trinomials Task Cards with QR Codes When A is Not Equal to 1.